O’Reilly Media released the results of its second-annual data science salary survey on Thursday (available for free download here), and the results were not too surprising. Essentially, it shows that people who work with tools designed for big data, machine learning, statistical computing and cloud computing make more money — often between $20,000 and $30,000 more a year, based on median incomes — than people whose jobs only involve tools such as SQL and Excel. In that regard, the survey doesn’t really tell us anything new. All the talk over the past couple years about competitive recruitment and high salaries for data scientists was true, and it was true precisely because companies want the people who know how to work with new technologies. They want this decade’s data scientists — people who can build AI systems or pipelines for streaming sensor data — not last decade’s data analysts. The survey has all sorts of interesting findings about how much people earn based on tools or combinations of tools they use, but two charts probably sum it up the best. 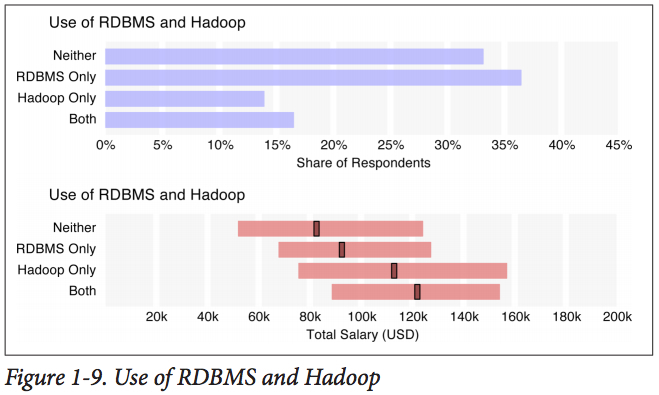 The first shows the gap in median incomes between people who use Hadoop and people who do not. 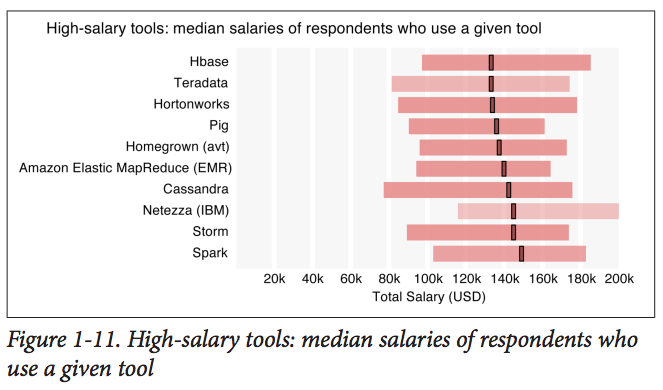 The second shows how use of bigger, faster and sometimes more advanced tools such as HBase, Storm and Spark increases median salaries even more. People can dismiss buzzwords like big data and data science all they want, but they’re tied to some very real and very powerful technologies. And apparently a lot more money, too. It’s a good thing companies are still hiring. According to a recent IDG SAS survey, there is still a dire lack of data skills with most respondents voicing their concerns around the organizational ability to demonstrate effectiveness in handling most critical big data tasks. If we are truly going to accomplish our goals of using data to improve operations, enhance customer experiences and develop new products, there needs to be a sense of urgency around skill development.